When considering the development of Art Deco and Modernism in American gardens, Fletcher Steele is the key figure. He had a design training; he had design talent; he was interested in Modern Art; he gave his professional papers to the American Society of Landscape Architects (ASLA), which deposited them in libraries, so that his work can be studied. Robin Karson published an account of his work in 1989 but he has not received the recognition he deserves. Her book opens with an inspiring quote from Fletcher Steele "I want all my places to seem the homes of children and lovers. I want them to be comfortable and if possible slightly mysterious by day, with vistas and compositions appealing to the painter. I want them to be delirious in the moonlight.... I believe that there is no beauty without ugliness and that it should not be otherwise. Both are capable of stinging us to live. Contrast is more true to me than undeviating smugness. The chief vice in gardens is to be merely pretty." Fletcher Steele also remarked that 'Next to cooking, gardening seems to be the most ephemeral of the arts'. Steele was born in Rochester, New York, the child of a lawyer and a pianist. They accepted the profession he had chosen in childhood and made sure he obtained a general education at Williams College. Fletcher Steele learned social graces befitting his future clientele - witty conversation, a zest for alcohol, a liking for female company and ability to charge high fees. After taking his degree Steel joined the Graduate School of Landscape Architecture at Harvard in 1907, at the age of 22. Harvard had begun teaching undergraduate landscape architecture in 1900 and replaced this course with a graduate programme in 1906. Fletcher Steele was in the second intake. Frederick Law Olmsted Jr was one of the teachers. In his two years at Harvard Steele considered that 'The one great teacher I had there, Denman Ross, more than made up for a lot of wasted time'. Ross taught aesthetic theory, not landscape architecture, and remained a friend after his pupil left Harvard.. In 1908 Fletcher Steele withdrew from his course when was offered an apprenticeship with Warren Manning, a former assistant of the elder Olmsted and a founder of ASLA. Manning had worked in his father's nursery before joining the Olmsted firm and taking charge of their planting plans. He adopted the picturesque style and was interested in city planning. In 1913 Steele obtained leave of absence for a 4-month tour of Europe. He was deeply impressed by the famous sights and filled his sketchbook with notes and drawings of the great gardens. On returning to America Fletcher Steele decided to found his own practice. His early garden plans are well-represented by the diagram of the Arts and Crafts style but, like Charles Platt, his detailing was more directly influenced by Italy than was the work of his English predecessors, Jekyll, Blomfield and Mawson. Steele used balustrades, hedges, urns, statuary, stone pineapples and flights of water steps. His interest in planting design was correspondingly less. He spoke of 'plant material' as one of the elements in a composition. Steele's inventive design talent is unmistakable. He had a sense of proportion and an interest in geometry. His curves flow. They are related to the contours. He experiments with the relationship between curved and straight lines. His detailing is always fresh. Steele lacked technical knowledge but had the good sense to employ assistants with an engineering bent. Fletcher Steele spent time in Europe, with the American Red Cross, during the First World War and became a regular summer visitor after the war. In 1922 he wrote an essay on 'French Gardens and Their Racial Characteristics'.in which he reviewed, critically, the work of the Vera brothers (Andrï¿½ and Paul) who admired cubism. In 1925 he visited the Paris Exposition of Modern Decorative Art (the 'Art Deco Exposition') and saw examples of cubist gardens with mirrors, concrete and coloured gravel. In 1930 Fletcher Steele wrote with enthusiasm of the garden designs of Andrï¿½ Vï¿½ra, Tony Garnier and Gabriel Guevrekian. Dan Kiley identified this article as a key influence on his own career. Steele's first opportunity to develop this enthusiasm came with his work for Helen Ellwanger in the 1930s. The rose garden was described by Steele in 1935 as 'almost modernistic' and would now be classified as Art Deco. It was made in what was then the most revolutionary of garden materials: concrete. A bold diagonal runs from curved steps up to and across an intricately patterned terrace. In 1926 Fletcher Steele met Mabel Choate who became his more important client. Aged 56, to his 41, she was about to inherit the family fortune and Naumkeag. Stanford White (McKim's partner) had been her mother's architect and Mabel knew how to work with designers. The Afternoon Garden (c1930) was her first project with Steele. In 1934 they extended the garden, with bold flowing curves, into the South Lawn. A Chinese garden was made (1937-9) and stimulated their interest in colour. 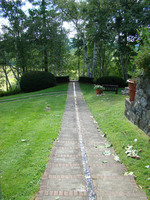 In 1938 they worked on what became Steele's most famous project, the Blue Steps at Naumkeag. The Oxford Companion to Gardens describes this beautiful design as follows: 'In the Blue Steps (of concrete painted light blue) rising in sweeps over small cascades through a birch wood, which he created, selecting trees of various sizes, he has successfully re-interpreted Renaissance forms in terms of the modern concern for values of space, form, texture and colour'. In 1952 Steele designed a rose garden with eleven scalloped waves of pink gravel. Steel's importance in the development of American landscape architecture, and the modern garden, lies in his influence on the young designers who passed through Harvard in the 1930s: Kiley, Eckbo and Rose. He proved to them the importance of creative design and the potential of modern art. As Eckbo remarked that Fletcher Steele was 'the transitional figure between the old guard and the moderns. He interests me because he was an experimenter'. Kiley says 'Steele was the only good designer working during the twenties and thirties, also the only one who was really interested in new things'.